Everett believes remuneration is the core of the issue , saying most of what seems to go wrong in financial services stems from the way people get paid, the way they are incentivised to sell products and give advice. Last year's Sedgwick report  in Australia, reviewing retail banking remuneration, tried to confront the issue of incentivising bank workers based on the volumes of sales they make. Everett says most of the major financial services firms get this and are work on improvements. "[But] what we're not convinced about, both on what we've seen before this, but also from what we hear from other sources, is whether those changes have really bitten yet. And it takes a long time to really change the entire DNA of an industry. So on the one hand I would say people need to recognise the sheer scale of what needs to get changed. But I also question the appetite of the people at the top of the banks and the insurers to understand just how radical that change needs to be," Everett said. "Writing a few policy memos and talking about how you are going to change your sales incentives, it's good but it doesn't even begin to actually really change behaviour. So we are absolutely going to be looking at that. How we get genuine assurances as to how much progress is being made in that space, that's a bit of a challenge." "I think that's what we have to respond to because there's a ton of stuff you could see firms doing here [on remuneration] that looks good but actually doesn't generate real change. And we're at a tipping point here. If the industry doesn't actually buy that, there's nothing anyone else can do to improve levels of confidence in it," added Everett. Speaking to  the Select Committee, Everett said there's plenty of evidence of things that should be done better by financial service providers, but no evidence of systemic and widespread misconduct as Australia's Royal Commission has exposed. Asked for examples of areas needing improvement, Everett said he was referring to work done by the FMA ahead of the current probe into bank conduct and culture. Examples he gave include incentive schemes in life insurance and disclosure of fund managers' fees. "We've had a poke at the life insurance providers  for effectively designing incentive structures which are absolutely inherently going to drive at least some advisers and brokers into selling or churning policies that they shouldn't be," Everett said. "We were having this conversation three years ago in New Zealand and probably long before I got here [in 2014], but they haven't changed at all." "So you look at that and think where's the appetite at the top of the industry actually to change? And some of that stuff would and could be easily changed from within the industry, but as far as I can see it isn't going to be. And then you end up with a political or regulatory intervention." As another example he cited disclosure of funds management fees. "Again the Government had to basically say 'no you've got to put dollar fees on statements ' because the research tells us that people find it difficult to engage with the percentages and they find it difficult to really understand what it's costing them. Again it took the Government to step in and say 'you need to do that.' So that's another example of an area where I think consumers are being let down by the industry," Everett said. 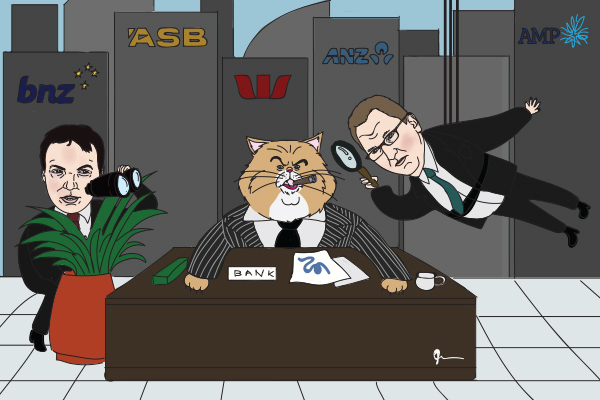 Everett has also indicated the FMA and Reserve Bank probe will take a look into banks' internal disputes processes with a view to ascertaining why relatively low numbers of disputes  make their way to the dispute resolution schemes such as the Banking Ombudsman. He acknowledged he has seen no evidence of banks gaming their internal disputes processes. "What we're trying to respond to, and we will be looking at this as part of the process, is that everybody including us takes heart from the fact that the levels of complaint here [NZ] are relatively low and would not seem to suggest significant pain points with the industry. But anecdotally you hear otherwise. Maybe disappointed people tend to speak louder than the rest, but I think also acknowledging the New Zealand culture is a little bit not to complain." "We just feel it's a space where we as the regulator, and probably the public, could get a much better understanding of if there aren't that many complaints getting to the ombudsman schemes or certainly to us, is that actually just because there's a filtering process and people are giving up? Or they're going away somewhat happy but not properly happy, and the underlying issues that might have caused the complaint in the first place actually haven't been fixed as a result," Everett said. "So is what comes to us and the dispute resolution schemes just the tip of the iceberg, and what do we know about the rest of the iceberg? Have we really gone in and asked the question? Have we understood it, have the boards of those organisations fully understood what is happening in there? And it may be there's not anything desperately toxic that comes out of it. But it just feels like it's hidden from view at the moment, and we'd like to take this opportunity just to get a bit more view into that," he added. Asked what the potential outcomes are of the FMA-Reserve Bank probe, from which a report is due in October-November, Everett noted it's a relatively short period of time to do what the regulators are doing, especially if the probe is broadened to other sectors. "What we think can be achieved in that period is a clearer sense of whether in fact the misconduct is in fact happening. And if it's not misconduct that looks like breaches of the laws and rules, nonetheless [in] what areas of the industry do we think consumers are not being well looked after, and what additional pieces of work we might propose or the Reserve Bank might propose to drill down further into those spaces? What legislative changes, if any, do we think we would recommend to the Government?" "The picture I foresee us being able to draw is areas where either the regulation or the industry and what drives it is quite good, and areas where either the regulation is light or just doesn't exist. I think insurance, that's an example being looked at at the moment, where either the regulation needs to be stepped up or the industry's response to it needs to be stepped up," Everett said. "We're not going to solve everything in three or four months, but I think we should be in a good position to draw a picture of what it looks like and to indicate areas where we think something needs to get done." In terms of financial advisers he notes a lot of work is already underway  through the Financial Services Legislation Amendment Bill currently before Parliament. The FMA has launched a thematic review into sales and advice in banks. And the Ministry of Business, Innovation and Employment is reviewing  the Credit Contracts and Consumer Finance Act. Ultimately Everett said the key is convincing the industry that the law is just the minimum requirement and often as business practices evolve the law gets, or should get, left behind. "You've actually got to fundamentally be thinking 'how do we make sure our customers get a better deal'?" In terms of the Australian Royal Commission, Everett said this has highlighted that a way must be found at the top of the industry to fundamentally change what they're trying to achieve. If this doesn't happen he maintains we'll be talking about these issues again in five years' time. "And that's the challenge. I think what the Royal Commission might have done is tipped it over the edge and I would ask why it wasn't over that edge five years ago. But i think what it may have done, at least what I hope it has done, is say to the industry 'you can't just look to survive this period and then carry on as you were before, because even if you think you can do that the public is just not going to engage with financial services. They're going to go elsewhere, or they're not going to engage at all and then your business models are under massive threat'," Everett said.